BE the CAUSE Campaign is the cooperative, annual fund campaign of the AFP Foundation for Philanthropy and our AFP Alabama Chapter. Thank you for your past gifts and to those who will be supporting BE the CAUSE Campaign this year. ethical and effective fundraising practice. When you make a gift to the BE the CAUSE Campaign, you are investing in the profession’s future and advancing philanthropy. To attract fundraisers and donors who reflect the diverse communities of our society. To help fundraising professionals succeed at all stages of their careers. To increase knowledge of philanthropy for effective fundraising practices. To provide fundraisers with educational and networking opportunities. 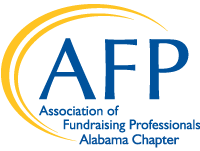 The AFP Alabama Chapter has the opportunity to receive back between 25 to 35 percent of the funds raised this year. Last year, we received back the top amount of 35% of what we raised because we met our goal! So the more you give, the more our chapter gets back for local programs.